Greetings from YFL!!! We might as well love Mondays with “positive energy, positive vibes, and positive lives”!!! They are a fresh start to a new week with gratitude for being alive and well!!! 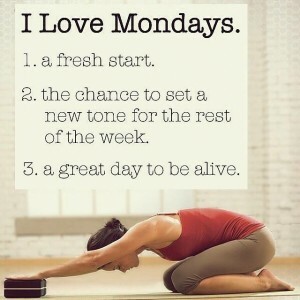 We want to help you maintain this sense of positivity and “fresh start” mentality, as you return to the mat at YFL!!! This week will be Classic Hatha, and our emphasis will be returning to the basics. The practice is very balanced with seated, standing, supine, and prone asana flows with an emphasis on connection to the breath, and a deep sense of body awareness. The Sanskrit focus is RAM (pronounced RUM), which is the mantra for the third chakra, Manipura, our solar plexus or navel chakra. Chanting this mantra helps promote good energy flow through this wheel of strength and power. Our mudra is also supportive of this chakra, and will provide energy to our pelvis, bladder, and kidneys. Our reflexology point will also emphasize the cleansing of our left and right kidney. Our meditation focus is Inner Strength, and is set to the music of Bhakti Hreem. This is the last week to join in the current 5-week Meditation I class with Deb. This is week two, and we meet from 7:30-8:30 p.m. The cost is $70. The deadline for registration for The Meditation and Chakra YTT Intensive weekend is 5/6. The cost is $195. If you need further information please contact Deb via email, call, or at the studio. The May YFL newsletter will be delivered to your email inbox this Sunday, May 1st at about 10 a.m. It will cover the 8 principles of moving the body safely through its range of motion, and will focus on the proper execution of the plank pose with single leg lift. As always, it will include handy info on yoga related products, recipes, and nutrition, and the quick six practice for the month. This entry was posted in Uncategorized on April 25, 2016 by Deb Potts. 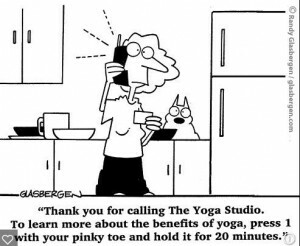 Greetings Yogis and Yoginis!!! Yes, it is time to increase your strength and stability, as we once again utilize the resistance of the wall. Deb will also be introducing the concept of the “Foot Pyramid” for proper balance and alignment in all standing poses. We will also be exploring the release of “Myofascial Tissue” along the back side of the body to enhance safer, deeper forward bends. Our Sanskrit focus is “JIKAN”, or that sacred space of silence between our thoughts. Our Mudra is the “ANAHATA”, or heart hand gesture, which connects us to the energy of love and compassion. This week’s meditation music is “A Moment in Time” by Ann Sweeten. Your meditation focus is “Silent Energy”. A new 5-week session of Meditation I begins tomorrow evening, 4/19, at 7:30. Deb will lead an introductory course on the practice of meditation. You will create a “tool box” of about 17 techniques for dropping into a meditative state, and learn the myriad of benefits to incorporating the practice into your daily routine. Deb has written a manual for this course, which is included in the price of the class. The cost is $70. You may still register today. The next YTT (Teacher Training Unit) is open to the community on 5/13-5/15/16. This 15-hour unit will be exploring in depth The Chakra Yoga program, and basic Meditation techniques. The cost for non-teacher trainees is $195. Registration is open through 5/1/16. Non trainees will meet 3-4 hours each day. The schedule is 11-2/3 p.m. on 5/13 & 5/14, and 9:30-12:30 on 5/15. This entry was posted in Uncategorized on April 18, 2016 by Deb Potts. Triple “R” Week!! !-Rest, Restore, Renew!!! Wow!!! 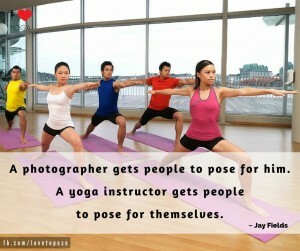 What a great group of trainees we have in our “Artistry of Yoga” program at YFL!!! We just completed a 15-hour intensive on the Anatomy and Physiology of Yoga, and how that knowledge applies to the safe practice of Yoga Asana. It was such a fun, and fast-paced weekend!!! Our next intensive will cover Meditation and the Chakra System. It is a 15 hour unit, and will be led by Deb. It is open to the community as well, and the cost is $195. The dates are 5/13-5/15. We will meet 5 hours per day. You may register at the studio, call, or email for details. Deb’s next Meditation I class will begin on Tuesday, 4/19 @ 7:30 p.m., and will meet for five consecutive Tuesday evenings. The cost is $70, and registration is ongoing. This week’s practice is all about releasing through our asana flow into a deep state of relaxation, renewal, and restoration, all while stretching the body, mind, and heart with profound intensity. Our Sanskrit focus is “Jnana”, or The Yoga of Knowledge and Wisdom. The weekly mudra focus is the classic “Dhanyi”, or hand gesture for contemplation and meditation. It is going to be a great week at Yoga For Life!!! Your meditation music is “Silence of the Stars” by Michael Hoppe, and your point of focus or “Dharana” is “Beauty”. This entry was posted in Uncategorized on April 11, 2016 by Deb Potts. Greetings from YFL!!! “Weight a Minute” is our theme this first full week of April!!! We will hold our own body weight and hand weights with breath and time to improve our strength, endurance, stamina, and power. Our Sanskrit focus is “Sadhana”, which means to “Practice” or “Accomplish”. Our mudra focus is the “Shunya” hand gesture, and it serves a dual purpose: 1) Improves hearing and ear maladies, and 2) Serves as a gateway to Heaven directing us to look within, purify, and then connect to higher levels of Consciousness. This entry was posted in Uncategorized on April 2, 2016 by Deb Potts.